The BITE 2 and BITE 2P Battery Impedance Test Equipment determine the condition of lead-acid and nickel-cadmium cells up to 7000 Ah. An advanced feature set has been developed that includes Pass/Warning/Fail calculations based on a user-entered baseline value, advanced printing functions and more. The case of the BITE 2P consists of both the transmitter and a carrying case for all of the standard accessories and some of the optional accessories, in an all-in-one unit. The BITE 2 and its accessories fit into a sturdy canvas case with a shoulder strap. The instruments work by applying a test current across the battery string while on-line, then measuring the total current (ac ripple + test current) and the voltage drop of each cell/jar. It then calculates the impedance. They also measure dc voltage and interconnection (strap) resistance to help determine the overall condition of the entire battery string's electrical path from terminal plate to terminal plate. The BITE 2 and BITE 2P receiver stores the readings in its internal memory. These measurements, along with other maintenance data such as ambient and pilot cell temperatures and ac ripple current, assist in determining the overall condition of battery systems. 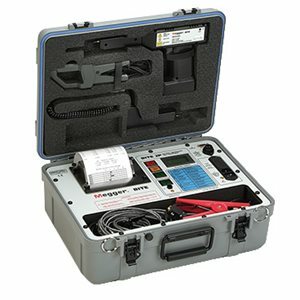 Megger recommends that impedance measurements with the BITE 2 or BITE 2P be made part of a battery maintenance program with readings taken and recorded semiannually for flooded batteries and quarterly for VRLA. Naturally, everything you need to perform these tests is included with the basic instruments. There is a full line of optional accessories to enhance the capabilities of the BITE 2 and BITE 2P. Both have the ability to download to a PC for data interpretation. Additionally, the BITE 2P has a built-in printer to review the active test but also to leave a hard copy record at the site. To view a demonstration of BITE2P, click here.